It is shocking how hard it is to find quiet places. Our planet is completely rumbling of humans machines. It does not matter where it is, in the ocean on land or in the sky. The situation just goes worse every year. But „quiet nature“ is not „nothing“. It can be a glorious soundscape with lot of details that can be really wonderful to listen. That is one of the reasons why „quiet nature“ is my favorite recording material. It is hard to find and always difficult to record. It is a luck to get a nice recording of ¨quiet nature“ It must be all in one, right place, correct time and specific calm weather. Most of Iceland is without trees or forest. It is mostly bare open landscape so sound can travel in long distances. Sometimes is it possible to hear traffic up to 30 km away. So just one car can cover a huge area with noise pollution for a long time. 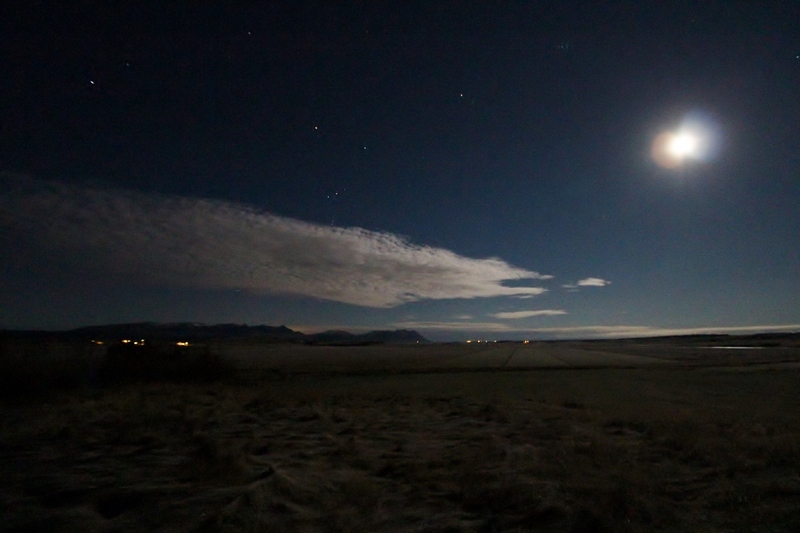 In October 2013 I was recording over night in Stafholtsunga, west Iceland. I located the microphones in a ditch to avoid traffic noise as much as possible. But traffic noise all over the county and air conditioner at nearby farm infected this recording most of the time. The recording starts between 6 and 7am. If you have quality headphones and sound card you will hear many other things than noise. You will hear in several bird species like raven, starling and swans and birds activity near the microphones. Also barking dog, sheep and horses in distance. You will hear some dripping sound from the groundwater in the ditch. Gust will also gently weep grass and nearby bush. Það er orðið skelfilegt hversu erfitt er að komast í „náttúrulega þögn“ án vélrænna hljóða frá manninum. Það skiptir engu hvar maður er og á hvaða tíma dags, hávaðinn er alls staðar frá vélum mannsins, í sjónum, á landi og í lofti. En stundum kemst maður í ágætis færi við „þögula náttúru“ svo langt sem það nær. Auðvitað mætti komast í þessa þögn fjarri mannabyggð en áskorunin er mest að ná þeim í byggð, enda er þar mjög margt áhugavert sem spennandi er að hlusta á án vélahljóða. Þann 20. október 2013 var ég í Stafholtstungum í Borgarfirði. Setti ég hljóðnema í skurð svo að umferðin í sveitinni kæmi sem minnst inn á upptökuna. Þarna má heyra ýmsilegt svo sem í húsdýrum, fuglum sem og ýmsu sem fer fram hjá flestum í dagsins önn.